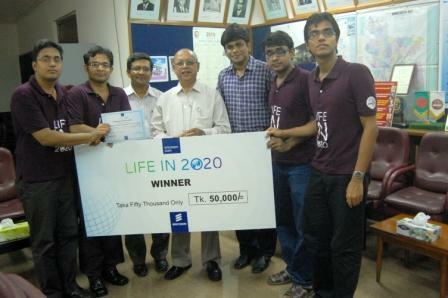 BUET team “Priory of Mavericks” won the championship title of “Life In 2020” contest arranged by the Ericsson Bangladesh Ltd. The competition was about creating a story on how human life will be technologically advanced in the year of 2020. The story created by the BUET team was very touchy and imaginative. The team plotted a story based on an innovative concept of 'Emulated Emotions'. While we are emulating and simulating so many things during our undergraduate study then why not our emotions and feelings! By the story they have shown that it will be possible to capture smell and touch using mobile phones as sensing devices and reproduce the similar thousand miles away. In the year of 2020, non-resident Banladeshi people staying outside for many years will be able to smell the fragrance of their mother's cooking of favorite dishes (like khichuri or eelish) and feel the touch of their little kids using mobile phones. Six universities were selected out of sixty universities for the second round and finally three universities were advanced to participate in the final round. The final contest was held on August 10th at the Sarina International, Banani, Dhaka. They had to give presentations on their respective themes in front of highly dignified panel of judges comprising prominent corporate figures. BUET team “Priory of Mavericks” was declared as the winner. IUT was declared as the 1st Runner up and Southeast University as the 2nd Runner up. The winning team members were Aungon Nag Radon (CSE), Md. Sabbir Ahsan (EEE), Nafi UR Rasid (EEE) and Md. Shamim-Ul-Alam (EEE). Dr. Ashikur Rahman, Associate Professor at the department of CSE, was the supervisor and the team leader. The team later met the honorable Vice-chancellor Prof. Dr. A. M. M. Safiullah at his office and the Vice-chancellor praised and encouraged them for their achievements and wished them a better future. Director of Students’ Welfare Prof. Dr. Jibon Podder and Dr. Muhammad Ali Chowdhury, Professor at the department of EEE, were also present at that time.